It's a loaded mailbag this week as Brandon Vogel, Greg Smith, Jacob Padilla and Derek Peterson answer your questions about Husker football, basketball and volleyball. DP: I don’t have any concerns. Everyone on Nebraska’s staff would rather take the time to build a relationship with a kid and get comfortable with them and their family. I remember in Grand Island in February when Chinander talked about going to visit a kid’s hometown and talking to Mom’s hairdresser and the school janitor. They take their time. Last year’s class is going to skew things a bit because they had to move fast but I think in the future we’re not going to see rapid-fire commits from kids super early. But that’s okay; I don’t see this staff missing on kids they target all too often because of that time they put in. GS: There are no concerns on my end about the start of this cycle. Mostly because this is by design and the staff acknowledged that they were behind on the 2019 class by nature of when it took the job. Remember that this staff had to put full effort into finishing the 2018 class between the early signing period and the traditional signing day. That prevented them from working ahead to the 2019 and 2020 classes like some other schools were able to do. Now that they are caught up with offers for 2019, they are focusing on building 2020 relationships during the current evaluation period. Expect the fall to be fast and furious with filling the class. DP: I’ll go out on a limb and say over. Stanley Morgan Jr. is getting drafted. That’s, like, not even a concern at this point. Tanner Farmer and Jerald Foster are both seniors, I could see one of them having a strong season in this offense and being a day three guy. Luke Gifford, Aaron Williams and Mick Stoltenberg are all defensive guys I could see having strong years and finding their ways onto a couple draft boards. I would probably put the number at three. BV: I’ll cautiously take the over, too. Morgan will get drafted and I think one of the offensive linemen sneaks in there late. And I have to think that somebody on defense is in the hunt, though I’m not sure yet who is the best bet. He’s got a long way to go in terms of on-field production, but Lamar Jackson still has enticing NFL size. If he were to have a big year, I could see him testing the waters. JP: I’ll take the over as well, and I think Derek mentioned most of the most probable candidates. The biggest thing for Gifford, Stoltenberg and Williams is to stay healthy. All three have been banged up quite a bit the last couple of years. If they can stay on the field, I think all three have the talent to put some good reps on tape. GS: I will buck the trend and say under. I think Stanley Morgan is a sure-fire NFL player like the rest of the guys. However, given the injury history of every other player being mentioned and lack of good production when they are on the field, I see a lot of undrafted free agents who would have a chance to stick if they stay healthy in the NFL. Lamar Jackson is in his own group as he clearly has the physical tools but would need a huge year to have a legit shot but we know he has NFL aspirations. DP: I guess it turned out to not really be a limb at all. I wouldn’t be shocked if he was one of those energy bigs off the bench for a team in five years, but if he keeps adding to his game that could be his floor. JP: The only high school recruit that’s really on their radar for the 2018 class at this point that I know of is combo-guard Amir Harris. He’s the guy they targeted to replace Xavier Johnson after Johnson left the class. Harris is a 6-foot-5 guard from Hagerstown, Maryland who recently took a visit to campus. Other offers for Harris include Oklahoma State, DePaul, California, Rhode Island and Auburn, with those last two looking like the primary competition for Nebraska. Harris was committed to Rhode Island for about a month in September and October before changing his mind. The staff feels pretty good about where they stand with him. As for the second question, Derek is right. 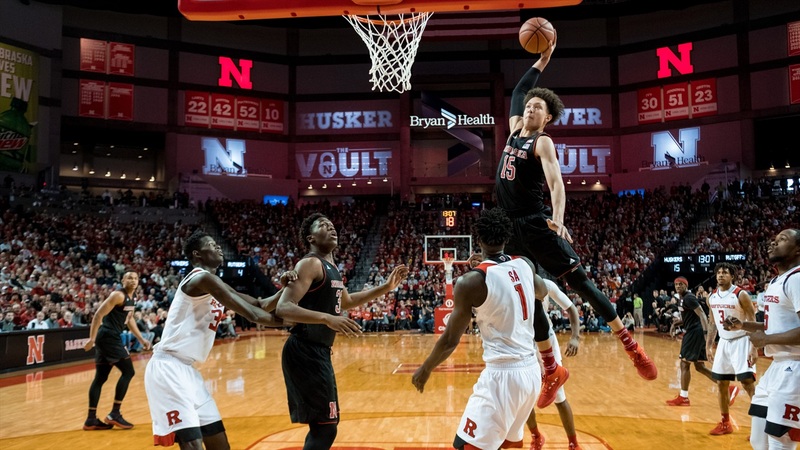 Nebraska fans need to be prepared for Isaiah Roby to be a legitimate early-entry option after next season if he makes a similar leap as he did between his freshman and sophomore seasons. At 6-foot-8 with a 7-foot-3 wingspan and a 40-plus-inch vertical leap, his physical tools alone will make him a prospect. Add in his much-improved perimeter shot and another year of adding strength to his frame, and Roby could be a hot commodity come the 2019 NBA Draft. He has legitimate first-round potential. BV: Nebraska is still likely in the market for a potential transfer. Should the Huskers get one that would change the dynamic a bit, but the coaches are pretty high on true freshman Nicklin Hames (though also a little nervous about only having one setter on the roster at the moment). Hames is a gamer, winning five state titles in high school (she played as an eighth grader in Tennessee). That said, she steps into perhaps the biggest shoes possible in trying to replace Kelly Hunter, one of the best athletes in Nebraska history regardless of sport. I’m pretty confident in Hames’ ability, but there will be growing pains just as there would be with any freshman. In terms of having the setter of the future on the roster, Hames checks that box, but she’s also the only setter of the present and Nebraska will have to find a way to address that in some way before the season starts. JP: Brandon is spot on. Nebraska needs another setter almost as much for practice purposes as for injury insurance. Last year while Kelly Hunter was on the shelf, Kayla Banwarth filled in as the setter for the B-side. I’m not sure Nebraska is paying her enough to do that for a full season. I don’t think any of the defensive specialists have a setting background either. Everything I’ve heard about Hames is that she’s the real deal, and I think Nebraska is confident in their upside being quite high with her as the starter by the time the postseason rolls around. But they still need depth.